I got new mascara by Giorgio Armani - "Eyes to kill" and it's fantastic! when I put it on my eyelashes. I have to book them and shoot them, etc. Completely in love with your purple satchel. Love your bag! So cute! Lets follow each other on bloglovin? Let me know when you're following me. Natalia look very nice, I like your necklace and bag. Such a great post! Loooove it! so simple - so great! great jacket and absolutely love the color of your bag! I really really like that blazer! Nice pick! Nice outfit! Your jacket is fantastic and I love your top! Sako, oglica i torba-NE MOZE BOLJE!!!! The top is wonderful! And I really love the combination with the nacklace!! 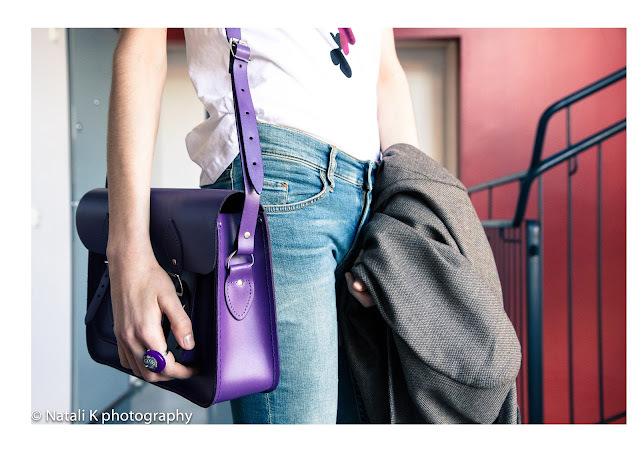 And even if I'm a huge fan of the cambridge satchel, I've never seen them in purple before, such a great pop of color! Such a classy blazer and a lovely satchel! Lovely outfit, love the necklace! OMG, the bag! the BAG! THE BAG!!! It is amazing! AMAZING! As well as you are. It's an effervescent look, very cool! those pants fit you like a dream! Great for anytime! Love that outfit. Love your necklace and the bag! Super cute blog & I love your outfit! amazing look!love your blog!check mine if you want!want to follow each other? Love this post! So great! purple is my favourite colour! gorgeous styling!love the perspex necklace! Those jeans look SO good on you! Thank you for your visit, have a great day! Perfect outfit,that bag is lovely as well. Your jeans have the perfect cut. I love them! Hi dear! I follow you...i love your style!